Believing it to be desirable to present to the public, in an accessible form, the history of our Supreme Court, the members of the Bar, at a meeting held in this city not long since, invited the orator of this occasion to prepare an address to that end. His familiarity with the subject-matter, and his ability to deal with it, warrant me in saying that their selection was an admirable one, and that the discharge of the duty thus imposed will meet with entire approval. I take pleasure in presenting to you, ladies and gentlemen, the Hon. Kemp P. Battle, President of the University. 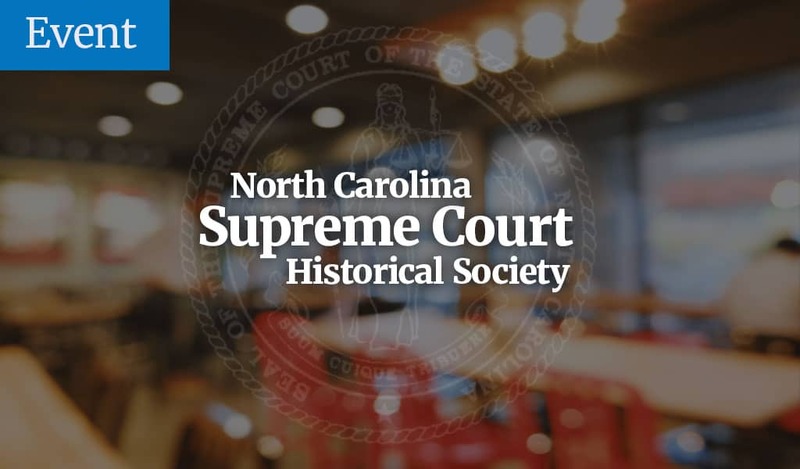 Gentlemen of the Supreme Court Bench and Bar, Ladies and Gentlemen: In tracing the history of the Supreme Court of North Carolina, we find that its origin is not the Act of 1818, which established it on its present basis, but that it properly begins with the first organized government in our State. I shall not attempt, however, to give in detail the successive struggles by which, from feeble beginnings, has been evolved this great tribunal, which controls so largely the peace and happiness of our people. I can attempt only a general review. There are no records of any courts in the Provincial period under Governor Drummond, prior to the assumption of the government by the Lords Proprietors, and for some years after the grant of their charter. I have no doubt of there having been such, because English people, whenever and wherever they settled-in the forests of Germany before the dawn of history, in the lands wrested from the painted Britons, in the wilds of America and Australia, South Africa and India-have never failed, moved by divinely-implanted love of order, which has made them great, to have the germs of an executive, legislative and judicial power; but the records of those courts have been, probably, forever lost. It might have been expected that there would have been inaugurated for the judicial system a copy-at least, a likeness-of the English system, but the grant of Carolina to the Lords Proprietors in 1663, enlarged in 1665, substituted for the king, as the fountain of all justice, eight sub-kings. They were vested with all the royalties, properties, jurisdiction and privileges of a county palatine, as large and ample as the county palatine of Durham. The Bishop of Durham possessed in old times an imperium in imperio. He created barons, appointed judges, convoked Parliaments, levied taxes, coined money, granted pardons, erected corporations, and, although his powers had, to some extent been curtailed by Edward I. and Henry VIII., many of them survived even to the reign of William IV. The Proprietors claimed, in fullest extent, the exercise of these prerogatives. After four years of provisional government, with entire confidence of success, they proceeded, in 1769, to put into operation the extraordinary scheme called the Fundamental Constitutions of Carolina, fondly described by them as the "Grand Model." There could not possibly be a more striking proof of the truth that all good government are slow growths, the product of the struggles and compromises on intelligent and well-meaning men, than this abortive product of Locke's metaphysical brain. Locke was a learned philosopher, and most of the Lords Proprietors were men of large experience and ability in various fields of human activity, one of them, Shaftesbury, of extraordinary genius, but their attempt at government was so unsuited to the people for whom it was intended, that it met with their scorn and resistance, and the historian's ridicule. These Fundamental Constitutions of Carolina were elaborately framed, on this principle, that the Proprietors had kingly authority, and were not subject to the Crown in the exercise of their government. The Supreme Courts created by that instrument were to be presided over by one of them in person or by deputy. Contrary to the statements of the historians of our State, this system was not entirely abrogated until the entire transfer of their jurisdictional rights to the Crown. The Chief Justice's Court, having charge of appeals in civil and criminal cases; the Constable's Court, having charge of military matters; the Admiral's Court, having charge of maritime affairs; the Treasurer's Court having charge of matters relating to the revenue and finances; the High Steward's Court, having charge of commerce and trade, external and internal; the Chamberlain's Court, having charge of matters of heraldry and ceremony, and matrimonial matters. There was to be no appeal from any of these courts. A quorum was to be the Proprietor and three counsellors, but the Palatine Court could authorize special cases to be tried by any three. There was likewise authorized a Chancellor's Court of one of the Proprietors and his six counsellors. Its jurisdiction was terrific. It extended to all invasions of the law, of liberty, of conscience, and of the public peace under pretense of religion, and of the license of printing. It was evidently designed to have the terrible powers of the King and his Council, which, under the name of the "Star Chamber," did such bloody work in the effort to crush liberty in England. The inferior courts were to be a county court of the sheriff and four justices, with general civil and criminal jurisdiction, and a precinct court of a steward and four justices, with criminal jurisdiction in cases other than capital, and ill civil cases other than those concerning the nobility. Trial by jury was authorized, but a majority carried the verdict. Some curious provisions of a general nature were made. For example, it was provided, as among the Romans, that "it shall be a base and vile thing to plead for money or reward." "To avoid multiplicity of laws, which by degrees always change the right foundations of the original government," "all statutes were to be ipso facto null and void at the end of 100 years after their passage." Further, it was enacted that "since multiplicity of comments as well as of laws have great inconvenience and serve only to obscure and perplex, all manner of comments and expositions on any part of the Fundamental Constitutions or any part of the common or statute laws of Carolina are absolutely prohibited." But among these and other like senseless provisions was found one in advance of the age. While Claverhouse was dispersing conventicles and John Bunyan and other brave spirits were languishing in prison, no man could be persecuted for his mode of worshipping God in Carolina. The Proprietors met at the Cockpit on October 21st, 1669, and organized themselves under the Grand Model. The aged George Monk, Duke of Albemarle, was by seniority the first Palatine, John, Lord Berkeley, Lord Lieutenant of Ireland, was chosen to be first Lord Chancellor, and Anthony Ashley Cooper, then Lord Ashley, afterwards Earl of Shaftesbury, was chosen the first Chief Justice of Carolina. In the following year, 1670, Earl Clarendon being in banishment, and Sir Wm. Berkeley Governor in Virginia, six Proprietors met. The Duke of Albemarle had answered his final roll-call, and Lord Berkeley was Palatine in his stead. Each appointed his deputy, Berkeley choosing Samuel Stephens, who thereupon became the first Governor under the Constitution. Shaftesbury, the Chief Justice, gave his appointment to Mr. John Willoughby, who thus became the first, so far as is known, of the learned and dignified line of Chief Justices in our State. The other deputies, including Willoughby, became the Council, which, besides having other functions, became the upper house of Assembly of Albemarle. The Proprietors, regretting that they could not put the Grand Model completely in operation for want of landgraves and caciques, instructed the Governor and Council to come as near to it as possible. The Governor, with the consent of the Council, was authorized to establish courts and appoint judges. Under these express instructions, to make as near approach to the Constitution as circumstances would admit, we find that the Governor and Council acted as the Court of Chancery, with almost arbitrary powers. They exercised the functions of an appellate court, not only as to questions of an equitable nature, but questions of common law and even fact. The Chief Justice, being a deputy of the Proprietors, was a member as of course, but not necessarily the Chancellor. The supreme common law court was called the General Court, in which the Chief Justice presided, with an indefinite number of assistants, appointed by the Governor and Council. Sometimes the members of the Council were assistants. What powers these assistants had does not appear. They probably were merely advisors of the Chief Justice (who received his appointment from, and held at the will of the Proprietors), as the assessors in Roman Courts counseled the proctor. This seems clear from the fact that the early instructions to the Governor required that they shall be "able and judicious persons," and it was only about forty years afterwards, in 1724, that they shall be "learned in the law." Certainly in early days they were not, except in rare instances, lawyers. In 1728, Governor Burrington quarreled with the Chief Justice, and sought to neutralize his authority by claiming judicial powers for the assistants. The Assembly stoutly contended, through John Baptista Ashe and Cornelius Harnett, the elder, that the Chief Justice was supreme, and that assistants only had power to inform and advise, "exactly as masters in chancery informed and advised the Chancellor." This view prevailed, although Burrington argues his point with ability. Again, I find when the Chief Justice was absent another was specially commissioned, the assistants not being allowed to hold the court. The assistants were allowed no salary or fees.